A to-the-point guide on blog post SEO. Everything you’ll need to know about getting your content to rank! When it comes to blogging for traffic, you may have found yourself banging your head against the desk while Google continues to rank blog post after blog post on page 32. If you’re among these ranks, you’re certainly not alone, and we’ve got the perfect solution that will save your head (and your desk) from any more trauma. If you want your posts to rank in the search engines, you’ll need to craft them in a very particular manner. It’s a clear and thorough resource that you can use for crafting your new articles or optimizing your existing content. We’ll runnin you through the process of optimizing a blog post from start to finish. By the time you’re done reading this, you’ll be ready to start writing content that ranks and provides more value to your readers than ever. One of your first considerations is the “who” behind your content. Who exactly are you writing for? Don’t write content for everyone if you want anyone to read it. You need to write with a voice that lets your reader know that you truly understand the issues that you’re trying to help them solve. While not technically “SEO,” personalization of content will help ensure your posts actually get read in their entirety. Google uses TOP (time on page) as a significant ranking factor. If your posts attract visitors just to have them click off a few seconds later, it’s a pretty good sign that your content isn’t what people want to be seen as a result for that particular search query. One of the best ways to determine the “what” of your blog posts is by listing all of the potential questions your buyers face. These questions will vary greatly based on the type of customer you serve, but every buyer persona has very specific questions that they’ll be asking that are all related to what you sell. Where should I be tracking my calories? Why is HIIT so effective for fat loss? When should I eat after working out? How can I make sure I work out? List as many questions as you can that are directly related to your product or service and even more that help answer questions people ask leading up to the discovery of your offering. This will aid you in deciding on topics to write about. Keyword research is an area where many brands struggle. Many don’t do it at all. Of those who do, most don’t fully understand how to select the right keywords for their posts. Keywords are words that Google uses to help understand what your content is about. If you don’t structure your article around keywords that you know people are searching for, you’re likely wasting your time. Where you may assume that a particular word or phrase may be a popular search term, writing based on assumptions could leave you with very little to show for your efforts. You don’t want to be spending hours on content production if you’re not going to generate any traffic. That’s where keyword research tools come into play. They allow you to better understand the number of times a word or phrase is searched for each month and the level of difficulty you’ll experience in ranking high in the search results for these terms. Keyword research is made much easier by paid tools such as Ahrefs and Semrush, but free tools like Google Keyword Planner exist as well. Once you’ve narrowed down a topic you’ll be writing on, you’ll need to select a keyword that aligns well with that topic. Choose a keyword that is relevant to the topic and, if possible, fits well in the title of the blog post. For example, “Fat Loss” would easily translate into a wide assortment of titles. Search volume is the number of times (on average) a particular word or phrase is searched for each month. This is why writing keyword-focused content is so important. If you write for a keyword that you assume is popular and only actually gets searched for ten times per month, you’re not going to get very many visitors from that post. However, if you take the time to identify whether or not a keyword is popular, you could potentially drive hundreds or thousand of new visits to your site each month if your content ranks on Google’s first page. For example: the keyword “blog SEO” is searched for about 250 times per month. Depending on your industry and how much traffic you need to generate to drive leads and conversions, you may decide that taking the time to write an article that may drive 100 or so new visitors each month would be worth it. Remember, just because you find a keyword with an SV of 250 doesn’t mean you’ll get all of that traffic. Clicks are distributed across all of the listings on the first page, but most people (80%) will click on the top 3 results first. Keyword research is far from that simple. Did you notice that glaring orange and green graph to the left of the search volume, did you? You’re not the first person to use a keyword planning tool, and that means other people have already identified most of the best keyword opportunities. That’s not to say that you won’t be able to find great keywords, you’ll just need to look a little harder to find ones with a lower level of competition. The keyword difficulty score (KD) is an indicator as to how difficult ranking on the first page for that keyword will be. The keyword “blog seo” has a KD of 69. This translates to “nearly impossible” for anyone but the biggest, oldest, and most authoritative SEO-related websites to try to rank for. However, in the screenshot below you’ll see that the keyword “low carb high protein recipes” has a KD of only 5. Plus its search volume is much larger, making this win-win for anyone writing for topics related to this keyword. Seriously, if you’re reading this and you have a blog that could use this keyword in any way, write an article for it! much as “blog seo” and would be MUCH easier to rank for. Not all keyword planning tools (especially the free ones) have a difficulty score, but most of the paid tools (like Semrush and Ahrefs) will have this helpful feature. SEO Pro Tip:: Focus on using 1-2 long-tail keywords (multiple word phrases) throughout your copy as they’ll be more specific to user queries related to your business. Broad-term keywords may drive a lot of traffic, but most of it won’t be looking for what you’re selling. Once you’ve determined your persona, your topic, and your keyword, it’s time to start writing. The length of your article is an important factor for a couple of reasons. Generally speaking, Google treats long-form content better. That’s why all of those 500-word articles you were pumping out three times a week never did anything to drive traffic to you. Sorry guys, but it isn’t 2010 anymore. To create content that ranks we need to create posts that genuinely help our readers solve problems and answer questions. For the most part, it’s nearly impossible to do that in a few short paragraphs. Google knows that more words means more information, which is why longer content tends to rank higher. This is a more recent trend as the world of content marketing has spread like wildfire, but it’s something to pay attention to. There are still shorter articles ranking, but those are being phased out every day to make way for those that truly help Google’s searchers. Yes, it’s a word. The comprehensiveness of your article is going to play a major role in its ranking. If you’re giving your reader everything they need to know about your topic, your article is providing serious value. While length is important, it’s because Google assumes length is equivalent to value. However, if your content is long and boring and full of useless extra words just to make it longer, your readers won’t stick around long and Google will use that as a sign to drop your rankings like a stone. SEO Pro Tip:: Compare the other posts that rank for your target keyword and compile a sort of “best of” article that pulls information from each to create one, all-encompassing awesome blog post. We talked about using your target keywords in your blog post but completely skipped over the important topics of how often and where. Don’t worry. We didn’t forget. When you write, try including secondary keywords (also called related keywords). This way your article can rank for those keywords and increase the total traffic generated by a single blog post. Additionally, Google uses these keywords and the words you use around your main keyword to provide context. They help Google understand whether your article is about Cars the movie, automobiles, or the band. SEO Pro Tip:: Your keyword research tool will help you discover related keywords. You can also look for them at the bottom of the search results for your focus keyword. As we mentioned earlier, keeping your reader interested in your article is a great way to show Google that your content is exactly what people are looking for. Even the most helpful resources can bore people to the point where they head off in search of something more enjoyable to read. That’s why it’s important to write in a manner that keeps people reading line after line, paragraph after paragraph. APP is an old copywriting formula that works wonders when it comes to getting readers hooked by your introduction. Agree – State something that gets the readers nodding along from the first words. It should be something related to the problems you’re trying to solve like, “For most of us, blog post SEO can be difficult…”. This simple formula piques your reader’s interests early on and gives them a reason to stick around. Bucket brigades are simple phrases that continue to spike interest levels by building anticipation about what’s to come. They keep interest from waning as people read, so they don’t get overwhelmed by a seemingly endless paragraph of intimidating content. Separate them from the body of the paragraphs above and below with a line of white space, and you’ll keep readers engaged for longer than ever by keeping their interest high throughout your entire article. Lists of things being mentioned are bulleted and not just included in the body of a paragraph. There are lots of lines of white space in between paragraphs, images, and headers. There are plenty of images to help break up the text. There are descriptive headings and subheadings that break up large blocks of text. The reason this article (and every article we write) is structured like this is because it helps to keep readers from getting bored or intimidated by a massive page of text. Up to this point, this article has over 2,000 words, but it doesn’t feel heavy and dreary when you’re reading it. Format your article to break up long blocks of text, and you’ll find your readers making it much further toward the bottom of your articles. As mentioned in the previous section, images help to break up text blocks. The right images also provide a lot of value to your readers. You’ve undoubtedly heard the old adage of a picture is worth 1,000 words. Use images, graphs, charts, and other visual aids to support your text. Online attention spans are fleeting, and your readers need something more than your copy to keep them interested in whatever it is you’re writing about. Once your blog post is ready to be published, it’s time to tell Google what it’s all about. Any good publishing platform will let you edit the metadata that Google uses to understand your post. This data is also what Google displays to its searchers. Title – An exciting and engaging title that preferably contains the keyword(s). Description – A 160-character or less description that outlines the value a reader will receive from your post and contains the keyword. Rather than displaying a snippet that it randomly pulls from the first sentence of your post, write your own description that helps draw readers in more effectively. SEO Pro Tip:: WordPress plugins like Yoast help make editing metadata easy. Yoast has its own SEO recommendations built into this plugin. Some are good reminders, while others are a little out of date. Don’t rely solely on this type of tool. Use this guide as the end-all be-all resource when it comes to making decisions about your SEO. Like your text and metadata, your images can also be SEO-optimized. When saving your images for web publishing, start by making sure they’re not too large. Their dimensions should be large enough to see clearly but not so large that they take up a ton of space on your page. Dimensions will vary from site to site, but a good rule of thumb is to aim for a file size of 600kb or less for each image. This smaller file size will also allow your pages to load more quickly, which your readers will appreciate and is something that Google uses as a ranking factor. All joking aside, naming your images helps Google to understand your content even further and even drive traffic from image searches. Instead, name your file “giant-purple-elephant-yourkeyword.” The keyword at the end will give your post that little optimization boost. Linking is a big deal in the SEO world. While the most powerful links are inbound links (from other websites to yours), linking internally can also help Google understand what your posts are about. Internal linking has the added benefit of keeping your readers moving through the buyer’s journey toward a conversion by getting them to read a related article of yours. The more time they spend reading your articles, the more they learn about your brand and the closer they come to solving their problem(s). For example, the perfect internal link for us to include in this article is a guide to developing your blog strategy. 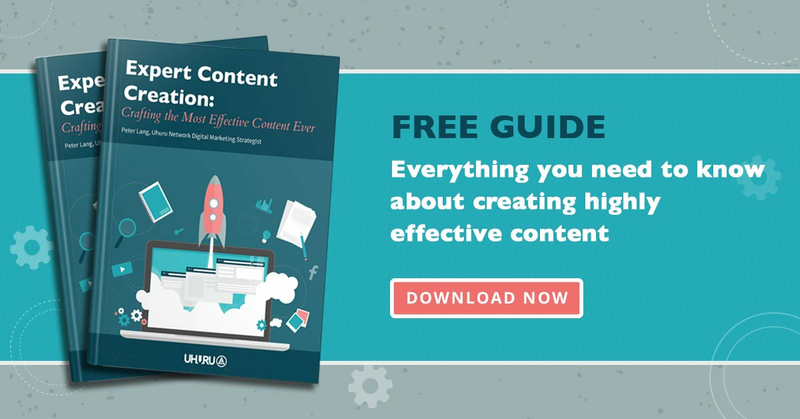 It’s an important read for those truly working to improve their content marketing. Every blog post you create should include a CTA, or call to action, which prompts the reader to take the desired next step in the right direction. You’ve just provided them with tons of valuable information, what do you want them to do with it now? Use image-based CTAs with contrasting colors to draw your reader’s attention and get them moving toward downloading one of your resources or participating in a trial. SEO Pro Tip:: HubSpot makes it easy to create personalized CTAs, displaying different CTAs to different people based on various qualifying criteria. Remember, your CTA must be relevant to the reader’s stage in the buyer’s journey. You can’t expect a TOFU/Awareness stage visitor to convert on a BOFU/Decision stage offer. Instead, prompt them to take action on a relevant MOFU/Consideration stage offer. Uhuru’s BOFU blog posts all contain a BOFU CTA at the bottom of the article. If you didn’t know much about blog post SEO, you do now. If you’re able to master the topics listed in this post, you’ll be amongst the highest level of content marketers. Start practicing sophisticated SEO tactics the next time you create content, and you’ll soon find yourself driving more traffic than ever before. Remember, this is a general list. It’s important to work to identify trends based on your own results and apply them to future content production and SEO efforts. The information contained in this article is based on driving long-term ranking success, but SEO is always changing. Continue to learn, and you’ll continue to see your results improve.